Welcome to my little spot on the web! Please feel free to comment or drop me a note! Last but not least, here's the 5th card I'm doing at my camp. It uses the Home For Christmas set from SU! I love the detail in this image :) I stamped in with black stazon, colored the image in with markers then added some green & white fun flock for the door wreath and snow. I tried to emboss the image first but that didn't work well with added the fun flock. I used the new in-color Soft Suede for my base, along with Real Red and Merry Moments DP. This image fit perfectly on the Top Note Die, which I also used inside the card. I added a piece of red ribbon for that extra touch. Now off to design some invitations for my son's FIRST birthday!!! 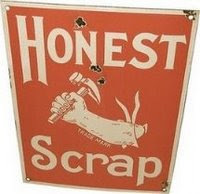 awarded me with the "Honest Scrap" award! Now I'm supposed to pass it along to 5 other deserving crafters and share 10 things about myself. Anita at the The Hovey Hut , Anita is my SU! Upline and she is a VERY talented lady! Next is a lady I met on Planet Paper Craft, Myrt whom cards I always LOVE and she is always so gracious. You can visit her at Myrt's Card O Craft. I met the next lady on Splitcoast, Lynn at Stamperosity, Lynn is a very busy lady who designs for Gina K and I'm always inspired by her creations! Finally, last but NOT least...Wendy another one of my "sistas". Wendy is truly an inspiration, not only with her paper crafting but with the battle that she faces everyday. Her strength is amazing and I can only hope to be as strong as this lady if the time ever comes. Check her out at Any Time of Life, It's Good to Be Alive! 1. I have 3 children, 2 from my first marriage (Abby age 11 & Lucas age 9) and 1 from my current and LAST marriage (Liam, almost 1 year). 2. My cat Sockey is older than Abby, he's almost 14! 3. I've worked for the Nova Scotia Liquor Corp for the last 5 and 1/2 years in the Merchandising division and LOVE my job! 5. I'm hooked on the Twilight series and can't wait for the New Moon movie this November!! 6. I'm addicted to coffee, chocolate and hugs from my kids. 7. I only like rainy days when I don't have to go out and can stay home wrapped in a warm blanket with a good book. 8. My BIGGEST pet peeve is sitting in traffic....I hate hate hate it!!! 9. I spend to much time on Facebook and not enough time in my craft room. Thanks for taking the time to "get to know me" and congrats to the above 5 talented and amazing women! Anyway....here's the 4th card that I'm doing at my Christmas Camp. 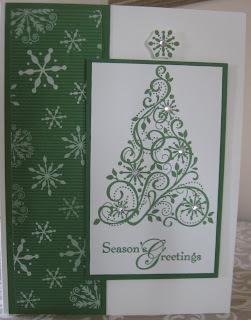 This one uses the Snow Swirled set with Whisper White, Garden Green and Merry Moments DP. You can't really see from the picture but I used dimensionals to pop up the tree and the star on top. I also added some stick on rhinestones for some holiday bling. I'll be back later day to share a blog award I received yesterday! I'm home from work today with a bad cold, but since I'm all drugged up on Advil Cold & Sinus (that stuff rocks btw) I thought I take the time to post the 3rd card for my Christmas Camp. This one I cased from Splitcoast, as soon as I saw it I knew I would use it for the camp. It's such a simple yet elegant looking card. It using both the Snow Swirled and Heard from the Heart stamp sets from SU! 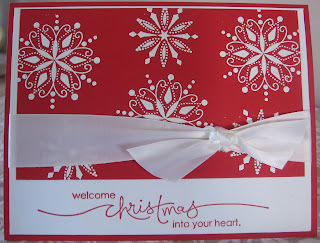 The snowflakes are embossied in white on Real Red cardstock with the sentiment stamped in Real Red on Whisper White card stock. A wide piece of white satin ribbon finishes the card. Can't wait for the ladies to see this one at camp, I'm sure it will be a favorite! Thanks for dropping by, come back tomorrow for card #4! 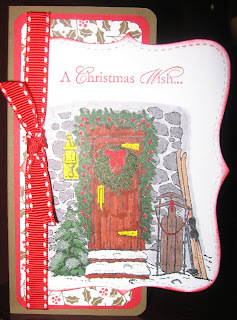 This is the second of five cards I'll be doing at my Christmas Stamp Camp in November. This one is done with the new Tree Trimmings and Christmas Greetings sets in the new 2009/2010 SU! Idea Book and Catalogue. 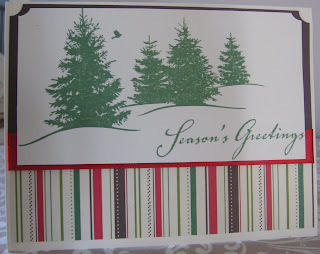 I used Garden Green, Very Vanilla and Merry Moments Designer paper along with Real Red and Garden Green ink. For the ornament "ribbon" I used the Gold Metallic Encore pad and added some gold brads. A piece of Chocolate Chip ribbon finishes the card. Wow, I've managed to post 2 days in a row! Think I can go for a third tomorrow?? I'll try! Wow...it's been awhile!! I've been back to work for the last 4 weeks and things have been CRAZY!! I did get some time this past long weekend to get my cards designed for my upcoming Christmas Card Camp, I have 12 spots and 10 are already booked! The first card is done with the Scenic Season set from SU! 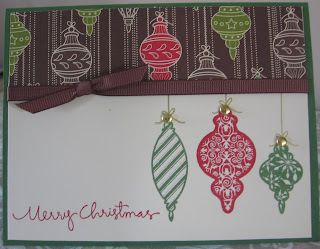 I used Very Vanilla, Chocolate Chip and Merry Moments Designer paper. Garden green ink and Red satin ribbon and voila a simple Christmas card! I'll try my best to post card #2 tomorrow. Thanks for stopping by! I am a mother to 3, a wife to 1 and a friend to many! I just returned back to work full-time at the NSLC after a year off on maternity leave. Although I'm busy with work and my family, I still try my best to find time to paper craft! 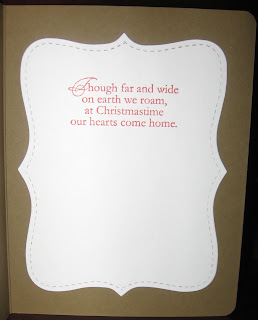 For those that follow me on this blog you'll find both Stampin Up as well as "other" crafting creations!